Dr. Thomas was named Chair of the Department of Urology at Tulane University Medical Center in New Orleans, Louisiana, effective March 1, 1996. He is also a Professor of Urology and the Residency Program Director for the Department of Urology. 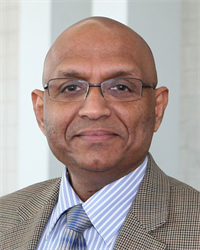 Dr. Thomas obtained his medical degree from the University of Bombay, India in 1975 and subsequently graduated in 1982 from the Urology residency program at Tulane University. He completed a fellowship program at the Tulane Primate Center co-sponsored by the American Urological Association and the National Kidney Foundation. Dr. Thomas' primary interests are in minimally invasive urologic surgery, including: laparoscopy, robotic surgery, and endourologic procedures. He has pioneered several innovative endoscopic and surgical procedures, and developed the principles for their use. He has promoted radical perineal prostatectomy in conjunction with laparoscopy as a minimally morbid alternative for management of prostate cancer. His career has been dedicated to finding minimally invasive therapy alternatives to urologic surgery. He has the distinction of introducing urologic laparoscopy in 1991 and was the first surgeon to perform robotic surgery in the entire Gulf South in 2002. His experience has earned him a place in advanced continuing medical education programs around the U.S. and the world. Dr. Thomas has authored over 180 scientific articles and book chapters. He is a member of several national and international scientific societies and is a peer reviewer for several urologic journals. Dr. Thomas’ career highlights include Presidency of the SES-AUA and the 31st World Congress of Endourology, and being recipient of the AUA Distinguished Service Award in 2016. Above all though, his rescuing and rebuilding the Department of Urology at Tulane University following Hurricane Katrina in 2005 counts as his greatest personal achievement.